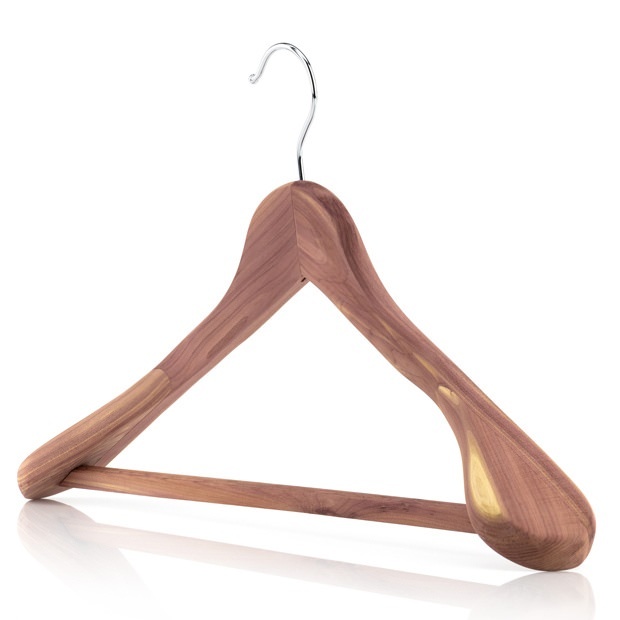 Quality clothes hangers made from cedar wood which naturally repels moths & insects and absorbs moisture & odours. An anti-slip profile on the bar prevents trousers from falling off onto the floor and collecting dirt & dust. The hangers slight wishbone formation, contoured neck, & broad shoulders with oversize 5.8cm bulbous ends are designed to mimic the human shoulders to provide support and keep clothing in its proper shape. By providing the correct support you will be reducing the stress put on the seams and stitching of your clothes which minimises deterioration therefore prolonging the lifetime of your garments. A smooth, 360°, chrome swivel hook means the hangers can be positioned in whichever direction suits your wardrobe or retail display. Hang t-shirts, shirts, blouses, trousers, skirts, dresses and coats with one all-purpose hanger. Naturally repels moths & insects. Inlaid non-slip grip strip on trouser bar. Wishbone design, contoured neck, broad shoulders & bulbous ends. Size: Width x Arm Depth 45cm x 5.8cm (17.5"x 2.3") approx. Excellent service and I was really impressed with the quality of the hangers. I would definitely purchase from them gin.